With the Government of India linking most of its services and benefits with Aadhaar card, it has become imperative to have an Aadhar card for all Indian citizens. Moreover, it is also imperative to ensure that your demographic and biometric details in Aadhar card are always up to date and accurate. In case there is a discrepancy in your actual information and Aadhar data, you might become ineligible for several government schemes and benefits. Usually, when you get a new Aadhaar card or update any information in your Aadhar data, you will receive a hard copy of the Aadhar card through the mail. In the meanwhile, you can also download online your e-Aadhaar card and use it in place of the regular Aadhaar card. The e-Aadhaar card is equally valid across the length and breadth of the country and can be used as a substitute to regular Aadhaar card. It is not uncommon to find errors in Aadhaar cards. This might be due to a clerical error on the part of the operator or you erroneously providing incorrect information. In this scenario, you must get your Aadhar information updated as soon as possible. Usually, after you apply for changes in your Aadhar card, it takes a few weeks for the changes to be done and in dispatching of your new Aadhar card. Now you can also download e-Aadhaar card through the UIDAI website with updated details, as soon as the changes are done to your Aadhar data. This way you need not wait for your Aadhar card to arrive by post. Also, having e-Aadhaar card also keeps your Aadhar information handy and eliminates the chances of you ever losing or forgetting your Aadhar number. As it is a digital version of your normal Aadhar, it is acceptable all over the country, without any exceptions. Here are the steps that you need to download online your e-Aadhaar card. 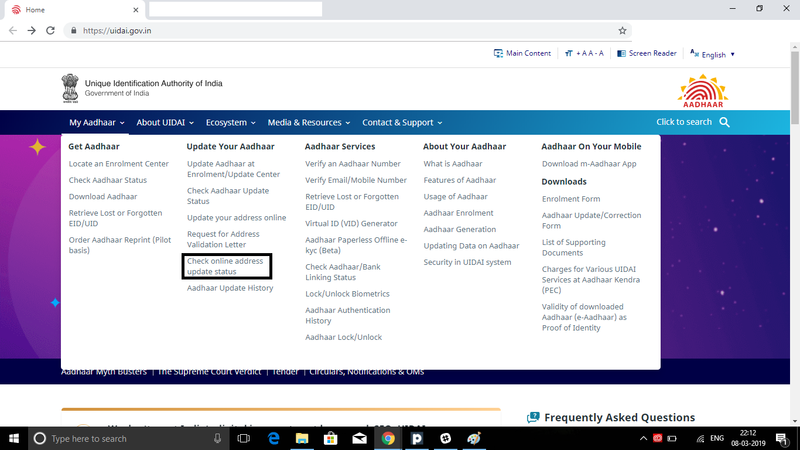 If you have done any changes in the demographic information of your Aadhar (name, age, address), then you need to first check the e-Aadhar status of your update request before downloading your e Aadhar card. Here are all the steps that you need to check your e Aadhar status. a. Log on to the official Aadhaar website . b. Now, click on the link “Check Status – Update done Online” if you applied for the changes through the self-service portal. c. Now, you will be redirected to the check status page, where you can check the update status of your request. e. You will be able to see if your Aadhar update request has been accepted or rejected. If it has been accepted, you can proceed ahead with downloading your e-Aadhaar card. In case your update request has been rejected, you will see the reason for rejection and the need to apply again. You can also visit your nearest enrolment centre to check your e-Aadhar status. 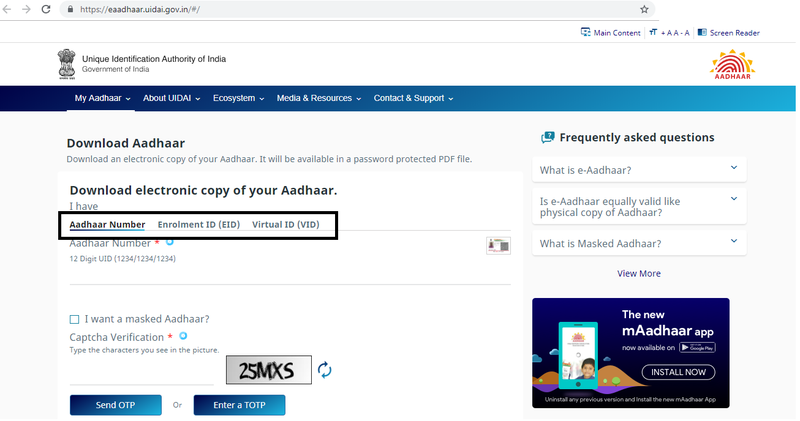 If you want to download your e-Aadhaar card to keep a digital copy with yourself, then you can skip the above-mentioned steps to check your e-Aadhaar status. Here are the steps to download your e-Aadhaar card. 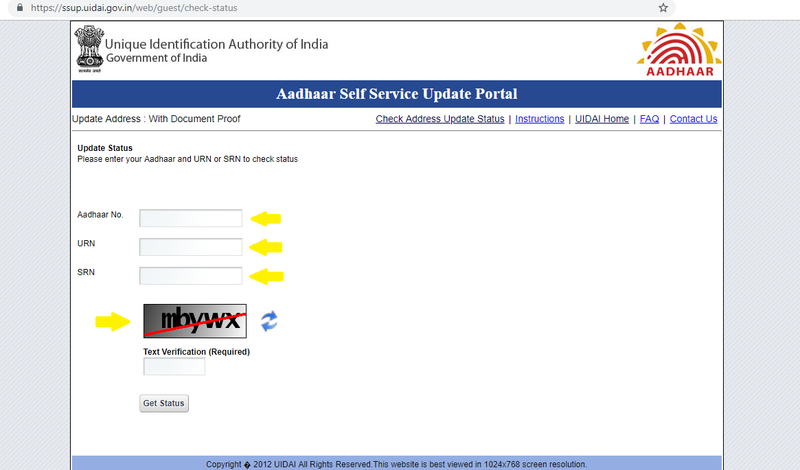 a. Log-on to the official UIDAI website at https://uidai.gov.in/. c. You will now be taken to a new page, where you will have to select the option through which you want to download the e Aadhaar. You can use your Aadhaar number, Enrolment ID or Virtual ID. d. Select any one of the above-mentioned options as you like. Now, enter all the details as required including Aadhaar number/Enrolment id/Virtual id, name and pin code. e. If you have a TOTP, you can check the box against it or otherwise leave in unchecked. f. Enter the security code and click on “Send OTP”. 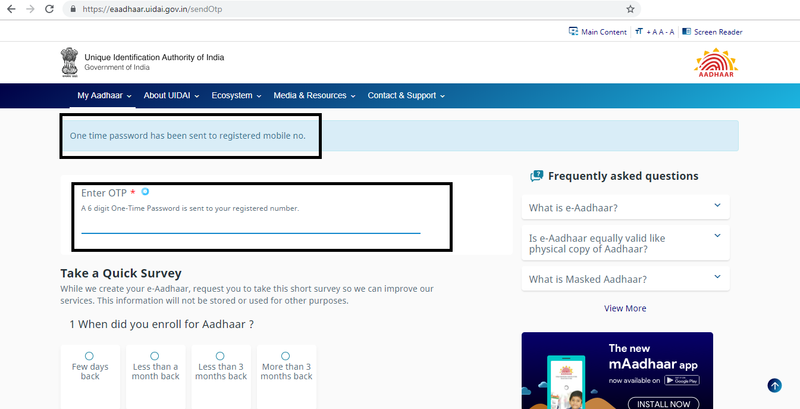 g. On the next screen, you have to enter the 6-digit OTP received on your registered mobile number and click on “Download Aadhaar”. h. Your e-Aadhaar card is now downloaded. To open it, you need to enter an 8-digit password which is made up of first four letters of your name (in Capital) and your year of birth. You can now take a print out of your E-Aadhaar letter and use it as you like. a. Visit your nearest Aadhaar enrolment centre. b. Provide all your details to the operator such as your Aadhar Number or Enrolment Id. c. The operator would enter all your details in the software. If you do not have your Aadhar Number or Enrolment id, then the operator would verify your identity through your biometrics. d. After verifying your details and information, you will be provided with a printed copy of your e-Aadhaar card. The operator might charge you a nominal fee against these services. e. Take multiple photocopied of this e-Aadhaar letter and keep it safely so that you can use it as and when required. E-Aadhaar is an excellent option for you to access your Aadhaar details as and when you require, even if you do not have access to your regular Aadhaar card. It is widely accepted across India for all purposes. Always take caution to keep your Aadhar information safe and do not share it with an unknown person.